It’s beginning to look a lot like Christmas. The lights are up, elastic has been added to all my waistbands & to my husband’s delight, Michael Buble’s Christmas album is already on repeat at home. With the festivities creeping in, I am transported back to this time last year when, knowing my penchant for mince pies, my workplace ‘Secret Santa’ decided to buy me 10 boxes worth (M&S, all butter, obviously). I tried to distribute them amongst my colleagues, but with 120 pies to get through there was only so much they could take. It was a dangerous time; mince pies became my normal breakfast fayre, elevenses treat & usually made an appearance at post-lunch dessert. A year later, I am on the verge of succumbing to my sticky habit. Fortunately, help is at hand by way of Natasha Corrett’s healthy, gluten & dairy free recipe. 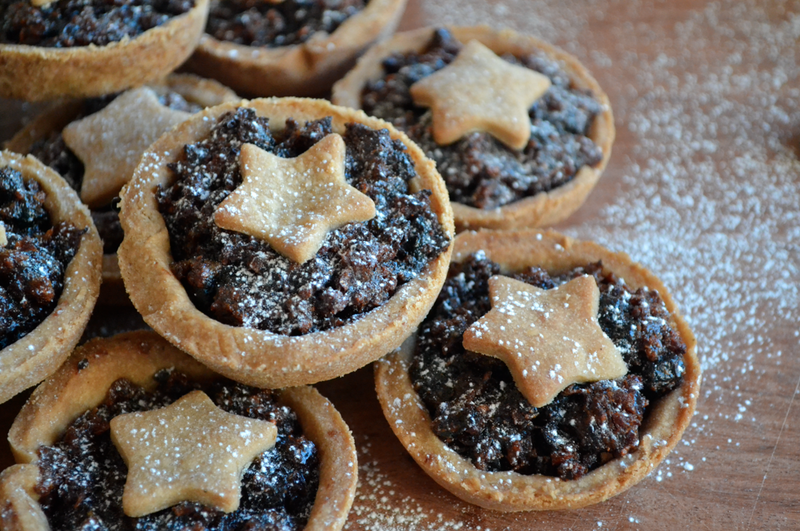 A mince pie that doesn’t compromise on flavour, but makes me feel slightly less guilty for eating 4 a day. Start by creaming together the butter, sugar & vanilla extract. Set aside & in a separate bowl add the different flours, xantham gum & salt. Combine the two mixtures using your fingers to make a dough. Knead for a minute or so before wrapping in cling-film & leaving in the fridge for 30min. In the meantime you can make the filling. Simply pop all the required ingredients into a blender & whizz to make a course paste. At this point you can pre-heat your oven to 170° & grease a muffin tray. Sprinkle some rice flour over your work surface and rub a little on your rolling-pin (to stop the dough sticking) before rolling out the pastry so it’s around 3mm thick. Using a cutter, (I just used a glass) you can start to stamp out rounds, re-rolling the leftovers until you have made 12. Gently line the base of the muffin tray with your pastry rounds & then carefully deposit 1 tbsp of the filling into each pie. Using the remaining pastry, cut-out 12 stars and place them on top of the filled pies. These need around 15min in the oven. S-O-T-H TIP: This recipe is quite forgiving; I substituted the gram flour for rice flour as although the former is usually easy to find, my local health food shops were all sold out. I also used Tomor instead of Vitagquel, simply because I already had some in my fridge. Lastly, although the filling mixture calls for 3 tbsp of agave, I found it a little bitter so added another one.